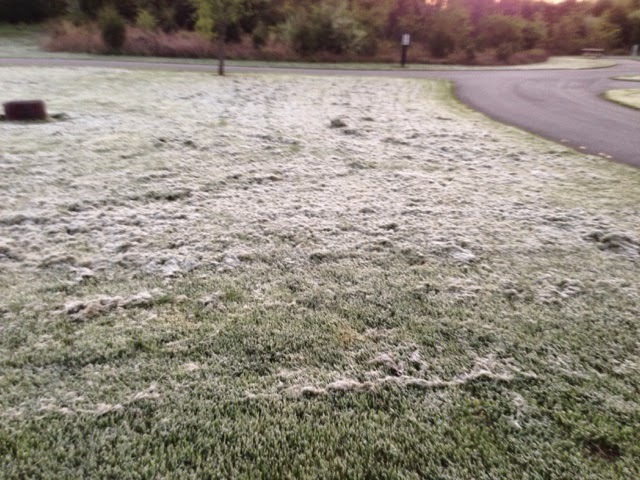 That is thick heavy frost on the ground and I had a frozen windshield on the outside. It wasvinvrhe high 20's last night. I was warm in my sleeping bag but didn't want to get out. What is worse was there was no way I was going to take a shower in that in heated bathroom this am after I paid for the night. I will deal with that later. I met a guy in the bathroom this am and he was waiting for hot water to arrive at the sink. He was still waiting when I left. 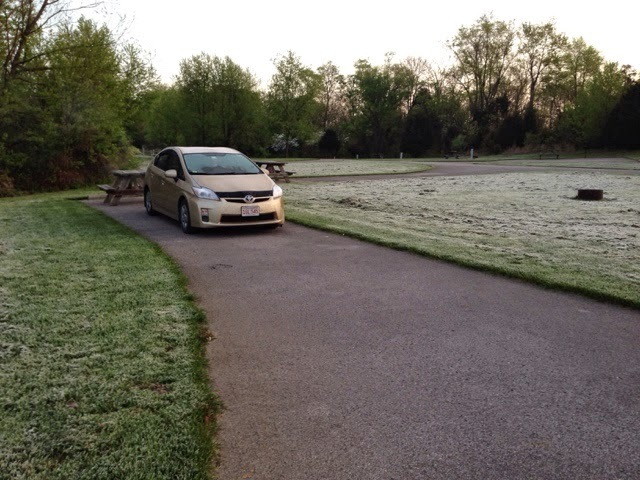 Down the road on the Ohio River from where I stayed last night is the town of Madison, Indiana. This town has one of the most beautiful houses of any town on the trip. Their Main Drag is also very nice with older buildings giving the town a wonderful character. 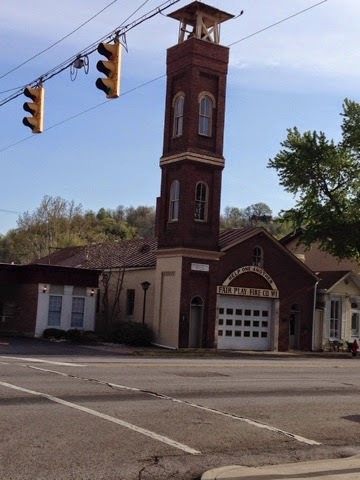 Towards the east end of town there is an old fire station with a wonderful hose tower. 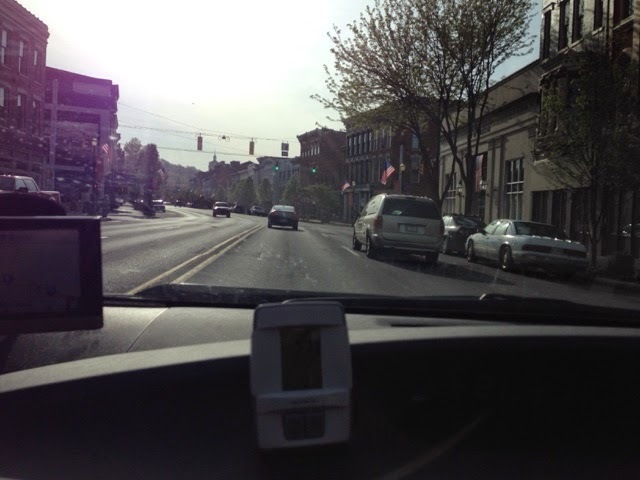 Although you can't see it in the picture there is a copper statue on top of a firefighter yelling orders in the horn. 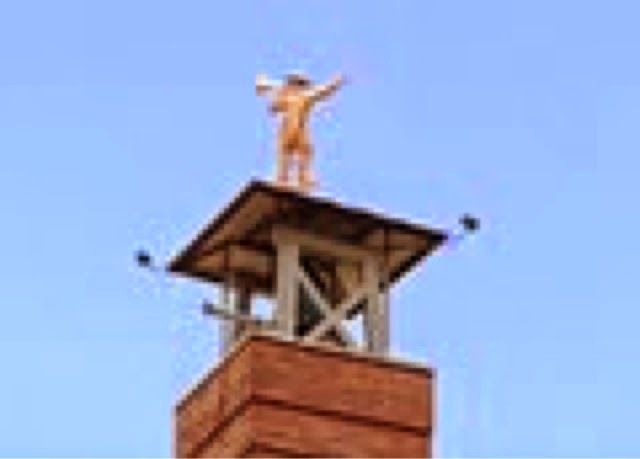 I got this shot off the web, although a bit blurry from blowing up) of the ornament on top. Very nice. 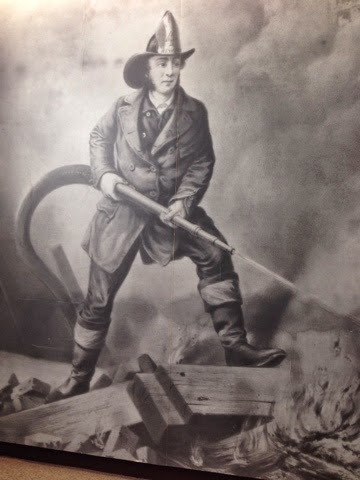 I made my way to Cincinati, Ohio and my stop for today at their Fire Museum. This is a very nicely done museum. One half of the basement is where the history starts. 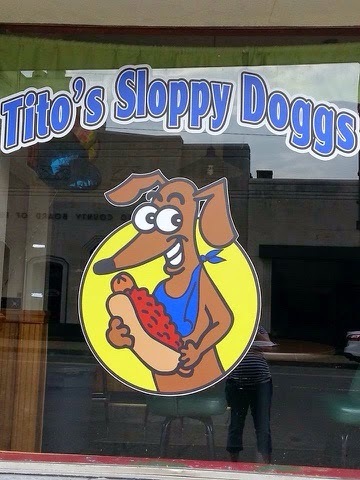 The other half is where they have children programs. They have this picture blown up on the stairwell. 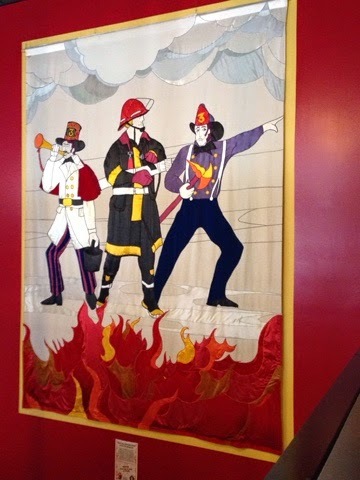 This tapestry is hanging on another stairwell. A lot of work went into this museum as you can see from this diorama. 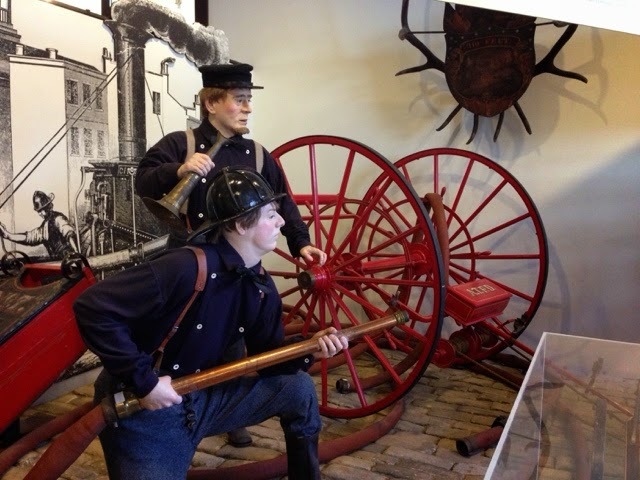 From what I gather, Cincinati was the first paid fulltime fire department about 1855. 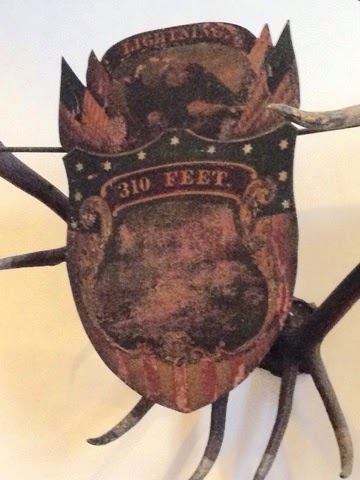 This shield was from the stack of one of their sum team fire engines. 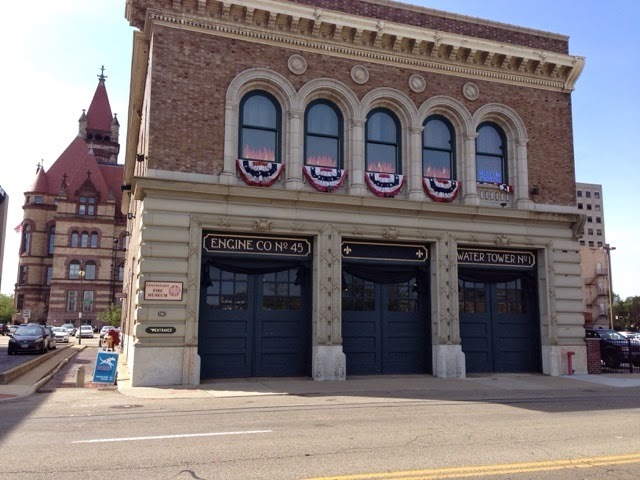 Cincinati is the home of Ahrens Fox fire apparatus. 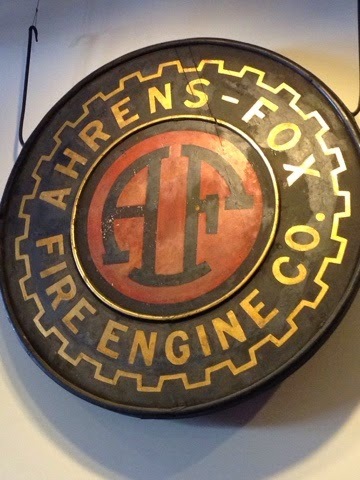 There was a previous history of making fire apparatus prior to Ahrens buying up the defunct company before him. 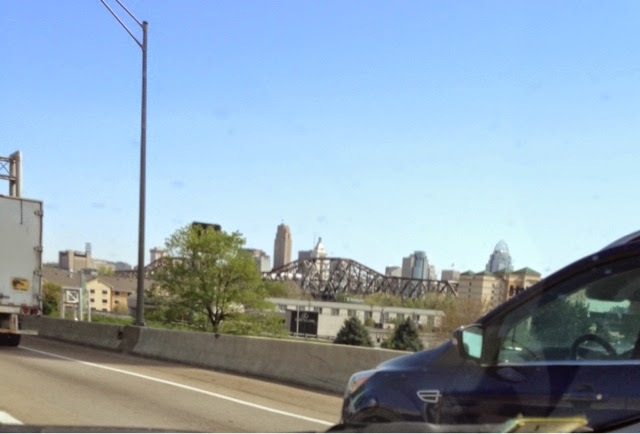 Prior to this style steam engine Cincinati had other first of their kind pumps built off the concepts of riverboat steam driven engines used on the Ohio River where they were situated. 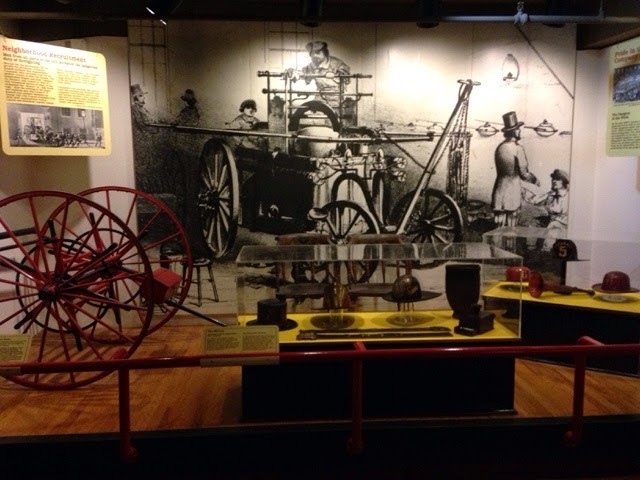 Around the mid 1800's Cincinati Fire Department also had all steam engines except for one hand pumper. 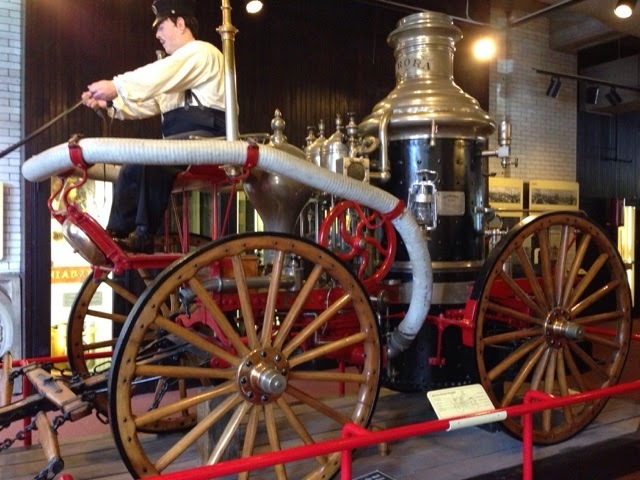 In contrast from my town's fire department we used handpumpers entirely up to 1919 when we got our first Ford Model TT pumper and continued to use handpumpers until about 1930. Cincinati faded out all handpumpers by about 1880's. This is a nice museum not hard to get to or park at if going by. 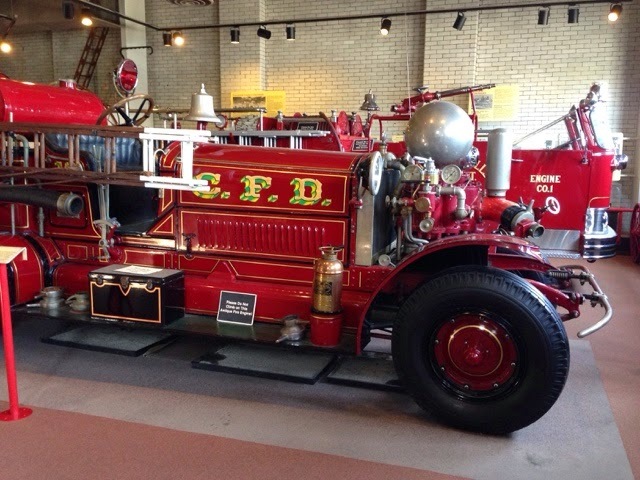 Since I put 46 years into the fire service I figured I would at least go to one Fire Museum on this trip. 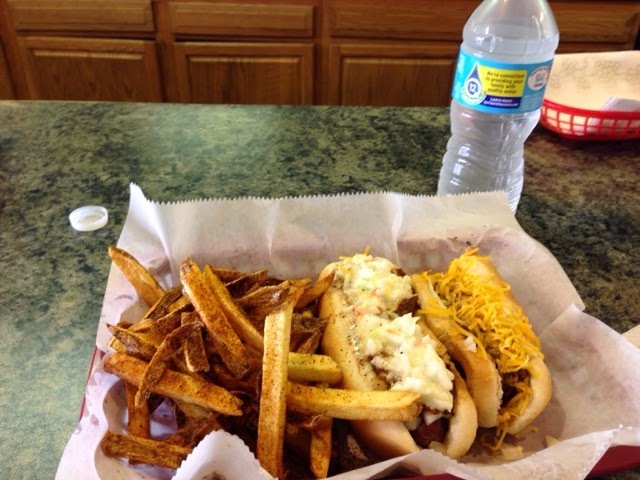 Two speciality Hot Dogs and frys for under $10.00. This is also a goo place to stop driving on I70. Easy off and on the highway. My day was not complete yet although I had planned to stay in this area for the night. My son Brent asked if I wanted to attend an event on Saturday with him and granddaughter Avery so I am driving to the Maryland Panhandle to get a jump on tomorrow's drive so I can arrive earlier in the am vs the afternoon. My place for the night is a Pilot truck stop so I can get a shower and a little to eat for dinner and sleep in the car for the last time boondocking for my 2015 Travels. Truck stops are noisy and I usually wake a few times but it doesn't bother me at all.